We had professional pictures taken when the kids were 14 days old. Nice story, here. Through my work I have become friends with the editor of Peekaboo magazine....a local publication. 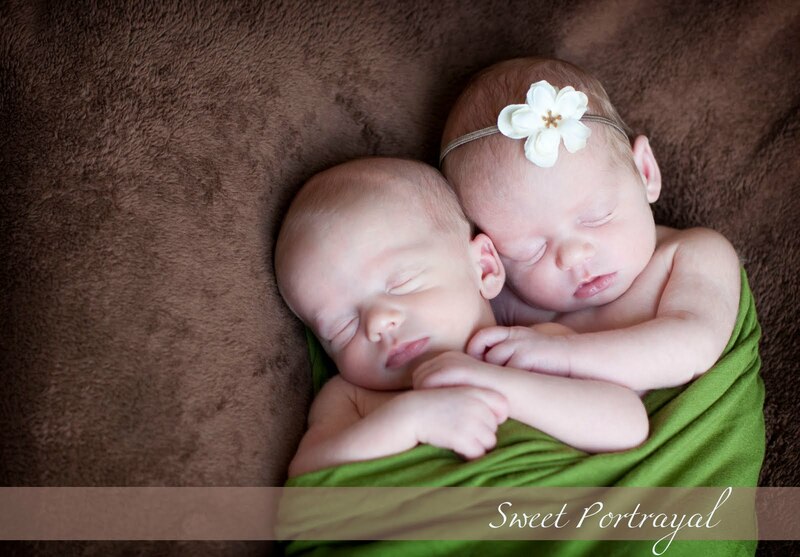 She told me right after the twins were born that she works with a professional photographer who wanted to offer us a free portrait sitting in order to work some twins into her portfolio. WOW! What a great opportunity! And we got some AWESOME photos to boot! This is the only one I have to share right now due to copyrights, etc. They are all over Facebook if you want to see more. Now we are going to go bankrupt from ordering pictures. Thanks to Kimberly Ginn of Sweet Portrayal in Rogers. I highly recommend her to take photos of your kids or family. She was so nice and spent 2 whole hours with us to get the perfect photos of Carley and Evan. I do have to say that is the sweetest thing ever! I just think she did an awesome job taking those pics! And it sure helps that you and Lee can make some beautiful kids! Much love! And I totally agree! A big thank you to Kim for the great job she did on the pics. How sweet they are!! !